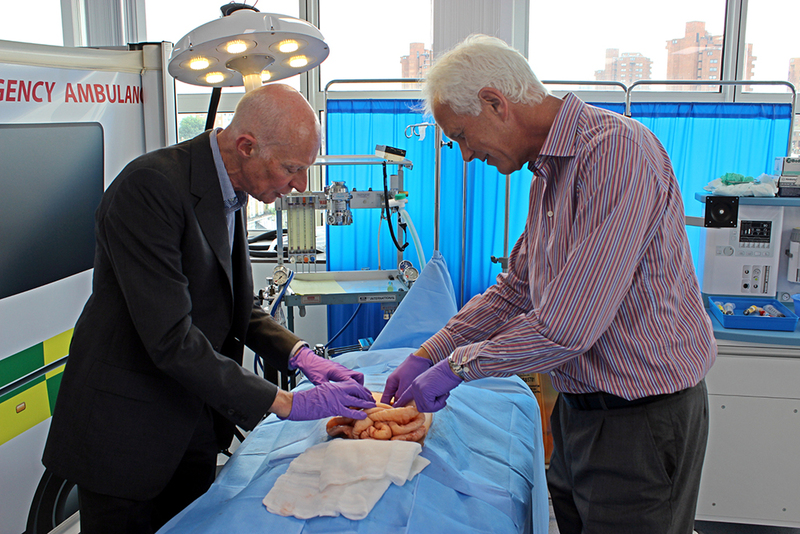 The Imperial College Centre for Engagement and Simulation Science (ICCESS) recently hosted a visit from Sir Philip Dilley, Chair of Imperial’s governing Council. Sir Philip learned of ICCESS’ work in combining medical simulation with innovative approaches to engagement after meeting Centre Director Prof Roger Kneebone at a reception at South Kensington earlier this year. Sir Philip graduated from Imperial with a First in Civil Engineering in 1976, and spent much of his engineering career with the Arup Group where he was Executive Chairman from 2009 to 2014. ‘A lot has changed at Imperial College since the late 70’s,’ says Sir Philip, ‘and one of the most impressive changes is the amount of cross-departmental collaboration and research.’ Much of the work of ICCESS brings together diverse teams, in one case even exploring lacemaking techniques to learn how to better manage threads during complex surgery. ICCESS played a major role at the North West London Simulation Conference on 21 September 2016. The conference brought together delegates with an interest in simulation delivery and development from a wide range of professions, including doctors, nurses, scientists and technicians. Dr Tanika Kelay, Dr Miranda Kronfli and Sharon-Marie Weldon demonstrated some of ICCESS’ simulation equipment and environments including their ‘simbulance’ and catheterisation lab. Sharon and Miranda also delivered two workshops in which they demonstrated ICCESS’ approach to multi-disciplinary simulation through the use of Actor Network Theory with an emphasis on the design process itself, using some of their recent research to highlight how this differs from current practice. Centre Director Prof Roger Kneebone was one of the keynote speakers and explained how ICCESS are reframing simulation as a means of engaging with different audiences to drive innovation in healthcare. The conference was very well-attended and the team reported that delegates found ICCESS’ work interesting and inspiring. The experience has generated a great deal of interest in the Centre’s ongoing projects with several new contacts who are keen to be involved thus building on ICCESS’s growing network of collaborators. A recent publication by Prof Kneebone provides further support for simulation as a powerful means of engaging with publics, patients and experts outside medicine. Simulation Reframed has been published in the Advances in Simulation journal and can be read here.